A slowdown in emerging markets has been cited as the greatest economic threat facing the events industry. 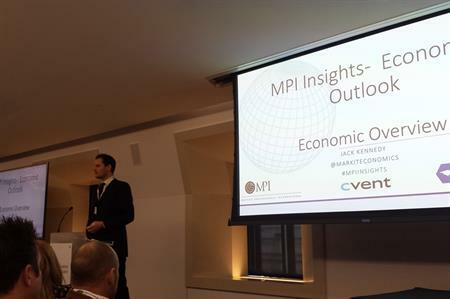 Speaking at MPI Insights - The Economic Outlook forum yesterday (18 January), senior economist at Markit, Jack Kennedy, said there had been ‘slow and steady’ economic growth in the UK since the recession, with a 2.5% increase predicted for 2016, a slight decrease from the previous year’s 2.7%. Service and construction sectors saw the greatest levels of growth, with the manufacturing sector faring less well. While developing markets have witnessed growth, there’s been significant slowdown in emerging markets, with the Chinese economic slowdown posing the greatest threat to the UK. "The Eurozone has seen the best quarter in 4.5 years, with the German economy holding up well, offsetting a slowdown in France. Despite these strong developments, slowdown in Brazil, Russia and particularly China poses economic concerns. The country has witnessed its greatest slowdown in 25 years." He added: "The greatest fear is a hard landing for the Chinese economy and the worry is that these jitters will translate into a self-fulfilling prophecy." Other potential risks included uncertainty about the approaching EU referendum and the predicted rise in interest rates, which are predicted to move from 0.5% to 1.5% over the next two years. Meanwhile, geopolitical risks are still having an impact on global economies, as the terrorism threat shows no sign of abating. David Goodger, director, Europe, Tourism Economics, said that domestic travel would remain key for all countries in 2016, amid the global tensions and geopolitical threats.